Global Enhanced Oil Recovery Market size for 2016 was valued over USD 39 billion and the annual capacity is set to exceed 5 billion barrels by 2024. Increasing number of matured fields along with growing need for crude to meet the petroleum product demand will foster the enhanced oil recovery market size. As per the Energy Information Administration, the consumption of petroleum and other liquids from the non-OECD region is projected to increase from 44.8 million b/d in 2012 to 74.8 million b/d by 2040. The mature fields accounted for over 70% of the overall production, with many of the fields in the secondary or tertiary production stage. Ability to raise oil recovery factor of well from 5%-15% to 35%-75% will favor the technology adoption. Government initiatives toward adoption of oil recovery technology coupled with associated environmental benefits will embellish the enhanced oil recovery market share. The U.S. introduced National Enhanced Oil Recovery Initiative to boost the crude production of the country and reduce CO2 emissions through the extended use of the technology. In July 2017, NEORI introduced a FUTURE Act to accelerate the installation of technologies to capture CO2 emitted from power plants and other industrial applications. 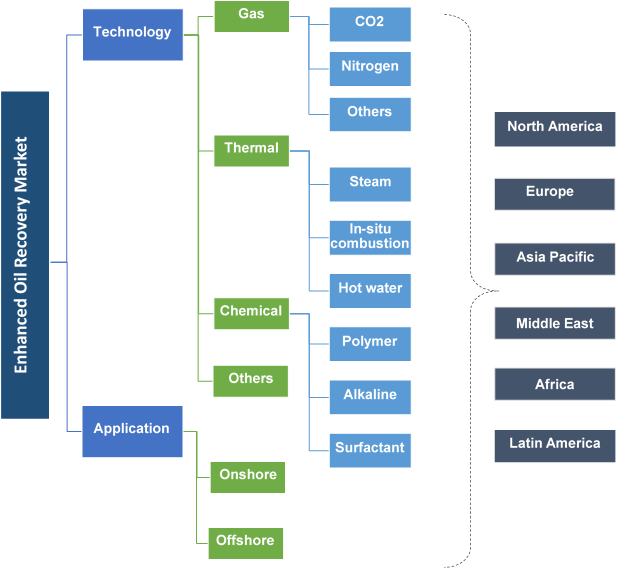 Technological advancements toward development of hybrid systems combining water flooding with surfactant or polymer to reduce the overall unit cost will stimulate the enhanced oil recovery market. Growing measures to adopt eco-friendly methods including microbial EOR will further influence the business landscape. Low chemicals cost along with potential to enhance recovery rates cornering by 70% will stimulate chemical enhanced oil recovery market growth. Companies are adopting innovative technologies to improve their overall production which may stimulate the product demand. For instance, Wintershall in collaboration with BASF has developed a Schizophyllan biopolymer EOR method to enhance productivity up to 10%. Flexibility of operation in shallow, dipping, thick, and high permeability reservoir owing to better heat utilization and gravity-assisted displacement will augment the thermal enhanced oil recovery market. Growing investments toward development of economically viable and environmentally sustainable alternative to gas-fired steam generation will further accelerate the technology adoption. In 2014, Royal Dutch Shell invested USD 53 million in the solar EOR technology which uses concentrated solar power to heat water and produce steam. CO2 enhanced oil recovery market size, in 2016 was valued over USD 10 billion. Ability to offer high miscibility with oil, low mutual solubility with water, and environmental benefits are some of the key features which will encourage the product penetration. In July 2015, Saudi Aramco launched a carbon capture and EOR pilot project with an aim to enhance oil production using 40 million MMSCFD of CO2 at the Uthmaniyah field in Saudi Arabia. Onshore enhanced oil recovery market share is predicted to witness gain over 19% owing to increasing number of aging fields along with growing focus towards heavy oil reservoirs. The U.S. Department of Energy estimated 89 billion barrels of additional oil trapped across onshore fields. In 2017, Kuwait Oil Company announced to conduct chemical EOR testing with an aim to increase production from 3.1 MMbbl/d to 3.65 MMbbl/d by 2020. Shifting trends toward offshore field on account of availability of resources and economic benefits will foster the offshore enhanced oil recovery market growth. In 2014, ExxonMobil Exploration and Production Malaysia Inc. invested USD 2.5 billion in the Tapis EOR offshore project to ensure sustainable and reliable energy supplies in the country. U.S. enhanced oil recovery market size in 2016, was over 250 MMbbl owing to ongoing government initiatives to boost production along with increasing oil consumption. In 2015, the U.S. crude consumption increased to 19.4 MMbbl/d from 18.5 MMbbl/d in 2012. Under the National Enhanced Oil Recovery Initiative (NEORI), the country has introduced several acts including Carbon Capture Act to encourage the use of captured CO2 for enhancing oil recovery. Increasing number of exploration and production projects in the amazon region will stimulate the Latin America enhanced oil recovery market. In 2016, Petroamazonas signed an agreement worth around USD 1 billion to recover 84.6 MMbbl of incremental reserves at nine fields and expand output by approximately 30,000 bbl./day in 2018. In 2014, Petroamazonas received EOR contracts at 17 fields in the Amazon region. Ongoing government plans and strategies to enhance crude production will augment UAE enhanced oil recovery market share. In 2015, the government of UAE planned to increase its oil production to 30% by 2020. In 2016, ADNOC announced to expand its use of EOR technologies as part of its 2030 strategy and five-year business plan to maximize the value of its resources. Growing demand to produce crude oil at low cost will foster the Malaysia enhanced oil recovery market share. In August 2017, Petronas announced to invest around USD 2.3 billion for the completion of an EOR program at the Baram Delta (BDO) production-sharing contract in Malaysia. Key participants in enhanced oil recovery market include Schlumberger, Baker Hughes, Halliburton, National Aluminium Company, Total, ConocoPhillips, Statoil, Occidental Petroleum, Lukoil, British Petroleum, Chevron, Kinder Morgan, Denbury Resources, Exxon Mobil, Royal Dutch Shell, Praxair Technology, Husky Energy, Wintershall, Cenovus Energy, China National Petroleum, Titan Oil Recovery, ADNOC and Canadian Natural Resources. Industry players are focusing towards inorganic growth ventures to expand their business presence. In November 2015, Wintershall and ADNOC signed a Memorandum of Understanding for joint research and development of chemical EOR. EOR is a technologically advanced method of bringing crude to the surface at the final phase of well. The technology is used to boost production to 35%-75% and transport & store CO2 safely in underground reservoirs. The properties of the reservoir fluid system which are affected through this method include chemical, biochemical, density, interfacial tension/surface tension, viscosity, miscibility and thermal. Ability to provides long-term economic value, certainty and longevity will makes its adoption preferable over other alternates.